After my first NFL game experience (read my NFL game review at Wembley, London) I have some tips on getting the most from your day. The queues for merchandise where huge the whole time I was there. That’s three hours before kick off. They have a large marquee and a few dotted around closer to the gates at the stadium. I watched people an hour before the game wait thirty minutes in line (no line to speak of actually) to finally get to the front and be told they had sold out of jerseys in normal size etc. But if you’re XL or XXL your in luck. The prices of the food around the stadium may shock some, but I don’t think they are that much more outrageous than London street food prices. There is the outlet shopping center which has a number of well known restaurants serving a variety of cuisines. While on the other side you’ll find the standard McDonalds! But I urge you to find the more authentic food stalls selling traditional American food for a slightly more authentic experience (not that they don’t have McDonalds in America of course). I opted for a Philly cheesestake from The Liberty Bell Company. Don’t be put off by the cheap seats. Unless you forget your glasses and are short sighted like I am, the seats on the top tier provide a good view still. I was sitting in the middle of the top tier but I could still see the ball flying through the air. Replays on the big screen are there for anything you need a closer look at. Make time for the fan area. I’ll admit,I didn’t get a chance to go to it as you need a ticket to get into the fan area (the person I was buying a ticket from didn’t turn up until near kick-off), but it looked fairly decent. As well as more food trucks, there seems to be a number of activities including what looks like an inflatable assault course. Okay, the match programmes may be £10, but if you’re a newbie to NFL, it’s packed full of useful information on American football and the two teams playing that night. May seem like an obvious one but it would have made the game much more enjoyable knowing what the hell was going on! 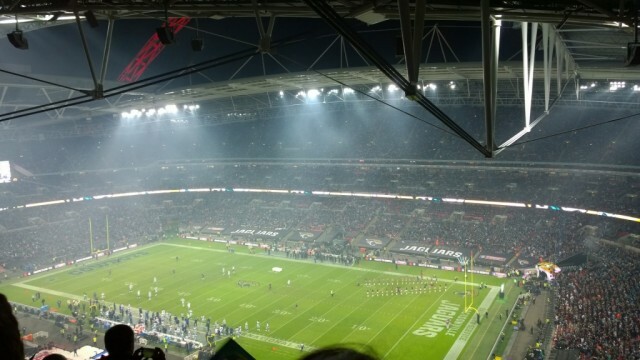 Do you have any tips or advice for an NFL game at Wembley? Tell me in the comments section below!